Ed Tech Richard Charity heads a music class at Spring Harbor for students K-12, who are part of the developmental delay program, with the students being diagnosed with Autism and mental illness. Music for these students provides them with input they crave and need, such as sensory input, movement and dance, and the pleasure of just listening to music! 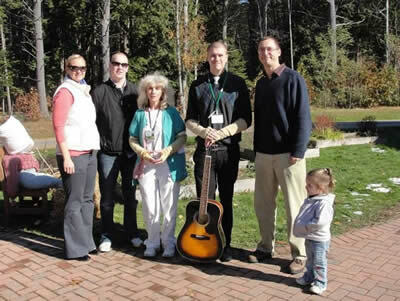 We provided the program at Spring Harbor with 4 acoustic guitars and an array of handheld percussion instruments, such as a cowbell, tamborine and shakers. The students were thrilled, as were we! Mr. Rollins is the band instructor at Greely High School, in Cumberland, Maine. 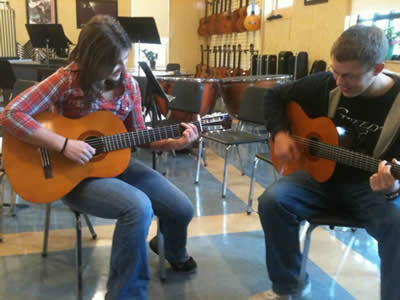 We presented one of his 9th - 12th grade band classes with 4 new Yamaha C-40 acoustic guitars. Mr. Rollins' goal with our donation was to introduce guitars into his curriculum, which his students were more than excited about! Ms. Harrison is the general music teacher/chorus director at Harrison Elementary School, in Harrison, Maine. We presented her and one of her chorus classes with a Sony 5-disc CD player, a Sony receiver and a pair of Sony speakers. Ms. Harrison's use for this equipment is specifically to use with the "pick-a-track" option that their Music Connection CD's offer. We were more than delighted to present her class with this gift that really worked well with her lesson plans and we were also able to surprise her with a $500.00 check to purchase additional items that she was in need of!